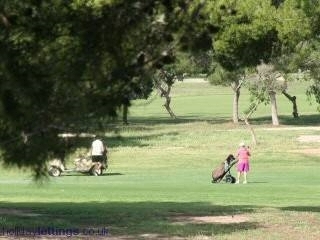 Golf Valencia Spain Information on Golf Courses here at Valencia on The Costa Blanca in Spain. For Golfers visiting Spain that wish to rent a holiday home it has never been easier or cheaper. There are thousands of holiday rentals all over the Costa Blanca that can be rented for the short term. Most villas and apartments can be rented direct from the owners with the aid of the internet, so large sums of money can be saved. The Alenda Golf Club is a splendid par 72, 18-hole golf course which is situated close to both Alicante and Elche. Private Rental Property in the Valencia Region. Km. 18 de la Ctra. Nazaret-Oliva (Carretera de El Saler) Parador Nacional de Turismo Luis Vives. Ctra. Valencia a Liria, desvío a la altura de San Antonio de Benagéber, Km. 4, a la derecha en dirección a Bétera. Ctra. de Bétera a San Antonio de Benageber, s/n. Camino Viejo Grao Gandia, s/n. Golf Course Guide Valencia, Golf in Spain Golf Valencia Spain.